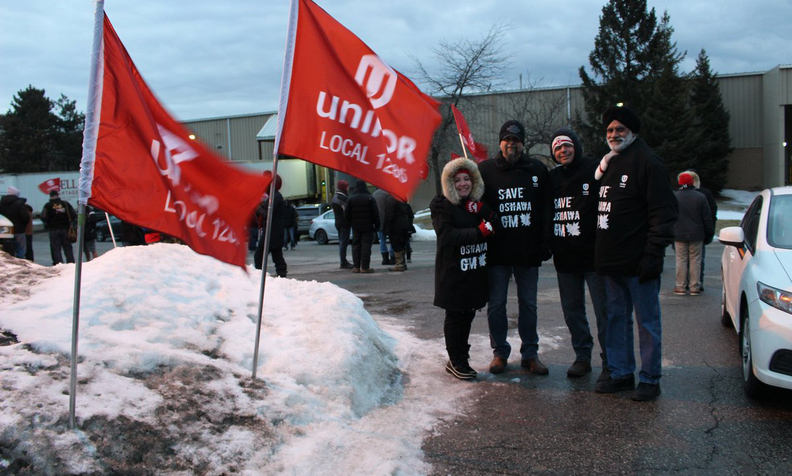 On Twitter, Unifor posted: "A solidarity event is underway at Lear Corporation in Whitby, Ontario in support of Unifor's #SaveOshawaGM campaign." TORONTO — Production resumed at General Motors' assembly plant in Oshawa, Ontario, on Friday, ending a near three-hour standstill, after striking workers at seat supplier Lear Corp. returned to work, the autoworkers' union said. After the Oshawa plant exhausted seat supplies, production came to a stop around 12:30 p.m. ET, GM Canada said. It was unclear if both car and truck assembly was affected and what impact the stoppage had on daily production, spokesman David Paterson said. Full production of Chevrolet Silverado and GMC Sierra trucks resumed at the Oshawa plant at approximately 3:10 p.m. ET, Unifor Local 222 President Colin James said. More than 200 Lear workers walked off the job on Friday, but the next shift went to work at 2:30 p.m. ET, ending the strike, James said. GM had a sizeable 149-day supply of Silverado trucks in the United States as of February 1. The automaker also says that production of its new Silverado/Sierra trucks at plants in Fort Wayne, Ind., and Silao, Mexico, has increased to the point where more than half the trucks sold are new models. The strike at Lear, which has 350 unionized workers, is the latest measure in a Unifor campaign aimed at convincing GM to extend Oshawa production to September 2020, when the current contract expires. Under a broad restructuring announced in November, GM said it will close Oshawa by the end of 2019 and has repeatedly said it will not change that decision. It was the second walkout to strike a supplier to GM's Oshawa plant. About 100 workers at the Inteva Products plant, also in Whitby, walked off the job Jan. 15. The Inteva plant builds interior products such as headliners, floor consoles and instrument panels for the Chevrolet Impala and Cadillac XTS, both of which are assembled at GM’s Oshawa Assembly. It also supplies GM’s Hamtramck, Mich., assembly plant, which builds the Impala alongside three other sedans. The Hamtramck plant is also in the automaker’s crosshairs when it comes to potential closure. Unifor also staged a sit-down protest on the day shift at GM's Oshawa assembly plant on Jan. 8, stopping production for about 90 minutes. Members then erected a blocked at GM Canada’s headquarters in Oshawa, forcing non-unionized, white-collar employees to work from home on Jan. 23 and 24. The union and Lear have also had a contentious relationship of late. Lear threatened to close its Ajax, Ontario, seating plant after 94 percent of union members who voted there rejected a tentative contract on May 1, 2018, and remained on strike. Two days after Lear made its intention to close the plant known, Unifor members ratified a new four-year labor contract to continue supplying Fiat Chrysler Automobiles’ assembly plant in Brampton, Ontario, where the Chrysler 300, Dodge Challenger and Dodge Charger are produced. Automotive News Canada contributed to this report.